I’ve always been a fan of using Lightroom’s Camera Calibration tab to make your RAW files look more like your camera’s JPEGs. Well, I’ve found, lately, that the same tab holds the secret to making my colors punchier and more vitreous–more lively. Let me show you what I mean. Right at the top there’s a slider called Shadows, and it slides from green to magenta (pink) with zero in the middle. As a portrait photographer, this is my secret weapon. Like you, I love to make portraits at grassy parks, or under shady trees so I can avoid the direct sunlight. Of course, I use the camera’s white balance settings to counter the blue of the sky, but the sun shining on the plants all around usually sends a green color cast under my subjects’ chins and into any shadow area. Previously, black and white was my best solution; now I just bump that slider a little to the right, to the magenta side and it counters the green, leaving much more natural skin tones and allowing me to show beautiful color prints along with my black and whites. Next you’ve got three sets of sliders for Hue and Saturation. I’ll tell you right now, 90% of my pictures look better with the Blue Primary slider moved to the right. I don’t know what it does, but the picture is usually pleasantly brighter, and all the colors look more lively, not just the blues. The only time I haven’t liked the results is when shooting cityscapes at night. Everything else looks better with a bump on the blue, often to 100%. I always try the green and red saturation sliders, but I don’t always keep the change. That’s the beauty of Lightroom: if you don’t like the change, just double-click on the slider and it zooms back to zero. the Hue sliders alter the basic color, and in my work I don’t usually need to do that. But I could use them to change a purple dress to teal with a quick click of the mouse. 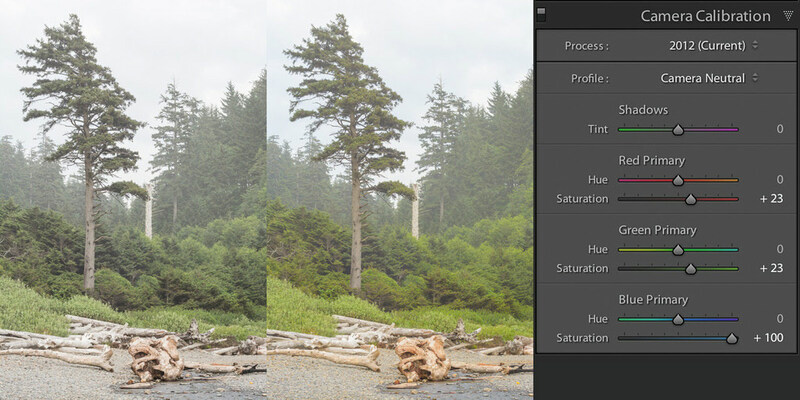 If you find yourself using the same settings on most of your pictures, why not make a preset and apply it during import? See the video in this article for tips on making presets. For me, it helps when I’m shooting to know that I can finish a picture with a certain technique. If you practice with these sliders, I think you’ll find, like I have, that your images have more professional looking pop, punch, and luster. It’s not the only way to do this, but since I’m a Lightroom user, it’s the simplest way I know.